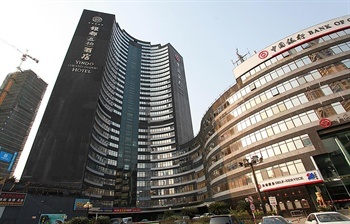 The Yindo Hotel (Zhuhai Yindu Jiudian) is one of the five-star business hotel in Zhuhai. It is conveniently situated in Gongbei, the bustling new city next to the border of Macau and the expanding Special Economic Zone of Zhuhai, about 70 minutes voyage by hydrofoil from Hong Kong and 30 minutes to Zhuhai Airport. The Yindo 299 gracefully decorated rooms and suites are equipped with private bathroom, air-conditioning, color television, radio, IDD telephone,in-room safe, mini-bar and satellite TV. 24 hour room service also available. The Hotel has 11 function and conference rooms offering a good variety of choices. Full audio visual equipment, luxurious rooms, enticing cuisine, a convention service team well-trained to suit you requirement. A business center that delivers the sharpest services. For recreation, there is a swimming pool, a mini golf course, a beauty saloon, a billiard room, a massage & sauna center, a night club, a tennis court and bowling. Other service available here including baby sitting, shopping arcade, shuttle bus and travel service. There are four restaurants within the hotel provide Chinese and Western cuisine. Among them, the the elegantly decorated Huntress Grill provide good western food. The Tea Palace is an unique venue generally featuring the Chinese tea culture.